By using AWS, we reduced our IT startup costs by 90%. These savings enable us to successfully launch JKOS. Established in 2014, JKOS launched the JKOS app in October 2015, which supports several services such as food delivery, taxi bookings, and payments. The company employs around 60 personnel based in its Taipei, Taiwan headquarters. By the beginning of 2017, more than 300,000 smartphone owners have downloaded and were using the JKOS app services to get connected with 40,000 Taiwanese businesses. The company is aiming to double the number of businesses currently accepting JKOS by 2018. From day one, JKOS ruled out developing an on-premises solution to support its JKOS app. Kenneth Yu, chief technology officer at JKOS, says, “We’re a startup company, and we couldn’t afford the upfront costs of an on-premises infrastructure.” Like many startups, JKOS saw that cloud-based IT, with its pay-as-you-grow model, would allow the company to carefully control its costs. “With the cloud, IT expenditure would increase only as our business expanded and revenues grew,” says Kenneth. When JKOS assessed cloud-service providers in the Taiwanese market back in 2014, the company found that only Amazon Web Services (AWS) could meet its needs. The AWS Cloud was already compliant with the PCI Data Security Standard (PCI-DSS) Level 1 and Level 2 guidelines for storing, processing, and/or transmitting electronic transactions by card holders. JKOS worked with AWS on the design of the JKOS cloud environment. “The documentation around the AWS Cloud was detailed and provided us with a good insight into building our AWS infrastructure,” says Kenneth. The company also engaged eCloudvalley, an AWS Partner Network (APN) Premier Consulting Partner, to validate its design before going live. Kenneth says, “eCloudvalley helps us to build a secured architecture and integrated software to meet our needs”. The launch of the JKOS app in 2015 was a success, and JKOS went on to launch its food-delivery service—which offers customers delivery services from 400 restaurants in Taipei—in 2016. “The extensibility of our AWS infrastructure was made clear as we brought the food-delivery service into play. We gained a very flexible platform,” says Kenneth. 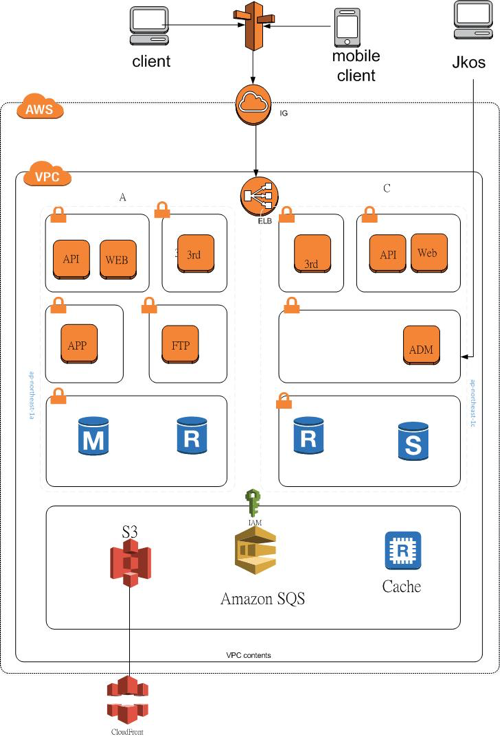 Data traffic emanating from the JKOS app are routed via Amazon Route 53 to the JKOS AWS infrastructure, which sits inside an Amazon Virtual Private Cloud (Amazon VPC). The data is then processed by Amazon Elastic Compute Cloud (Amazon EC2) instances running web and application servers. These servers have access to replicate Amazon Relational Database Service (Amazon RDS) instances, storing data on customers and vendors. The infrastructure also makes use of Amazon Simple Storage Service (Amazon S3) for backups and imagery. Amazon Simple Queue Service (Amazon SQS) in conjunction with Amazon CloudFront is used to relay messages to customers that transactions have been completed. JKOS has reaped substantial cost savings by choosing the AWS Cloud instead of building an on-premises infrastructure. “By using AWS, we reduced our IT startup costs by 90 percent. This saving enabled us to successfully launch JKOS,” says Kenneth. As the company grew and added more customers, the IT infrastructure supporting JKOS had grown too. But the pay-as-you-grow model has ensured that IT costs have risen in line with revenues, thus preventing the rise in cost from becoming a problem. The scalability of the AWS infrastructure has allowed JKOS to maximize the returns on its marketing campaigns. For example, after one campaign, JKOS saw customer numbers increase tenfold in a single month. Nevertheless, the company was able to scale its IT accordingly so every new customer gained the same high level of user experience. The reliability, scalability, and low management costs of the AWS Cloud are proving a valuable combination for JKOS. With the success of the company’s food-delivery service, JKOS is growing its brand and its revenue. “We’re able to develop new JKOS services without increasing our labor costs and worrying about scalability, especially during peak periods,” says Kenneth. Learn more about building mobile apps using AWS.